Our little ones especially need our attention. They need our care. Sometimes we can become frustrated, forgetting that they are not as grown up as Big Sister, or Big Brother. We might wonder why there is quite a bit of bad behavior that needs weeding out? We need to remember that they are precious, gifts of God, still in need of our training. Some times in large families, the younger set of children does not get the time and attention that the elder ones received at a younger age. The parents forget the industry that was needed to get the older children to be trained in obedience and Godly character. We need to take special time and attention to care for our littlest blessings. They should be a top priority and not be forgotten in the wake of homeschooling, cleaning, and special projects. Schooling and taking care of the home must of course not be neglected, but priorities must be set in order so that the necessities are completed, while reserving time just to devote to the little children. They may have so much to say to us, so much that we may tire of it! 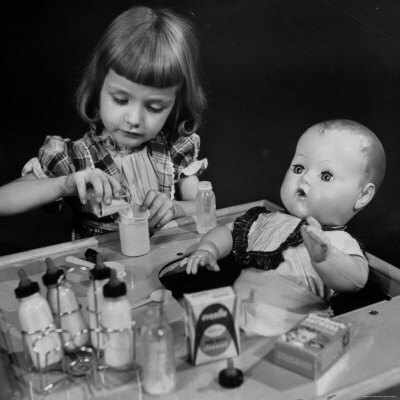 There may be stories of their baby dolls that they want to tell you. Those baby dolls are real to them. They want to share it with you. Your little boy might just want you to sit with him and watch him pretend to do man things, or draw a picture. He will smile big if you come to sit. Story time is such a precious shared enjoyment between Mother and Children Dear. There are good sources of children's books in my Links of Interest page. Nothing beats reading The Holy Bible to them either. Read it through, and then read it again. Pray with them at a very young age. Encourage them to pray, also. They may be a little shy at first, but you will be inspired by their sweet murmurings to the Father. When I first started having babies, I would read the Bible to the newborns as they nursed. What precious moments. Soon the little ones will not be little anymore! Enjoy this time of busy days, filled with love and laughter (if only you will make it that way, Mother Dear). Never weary in well doing. They do grow up so fast and before you know they have left home and started their own families. I use to love reading to my sons, probably as much as my mum enjoyed reading to me as a little girl. Great post! Thanks for posting this...sometimes I think we just all get caught up in life and just need to remember to sit back and relax with our children. Thanks for this gentle reminder. I have been sick and the house has been a mess. I needed to read this today! I'm so glad it was helpful.